← Storyline #16: Exodus 19-24. 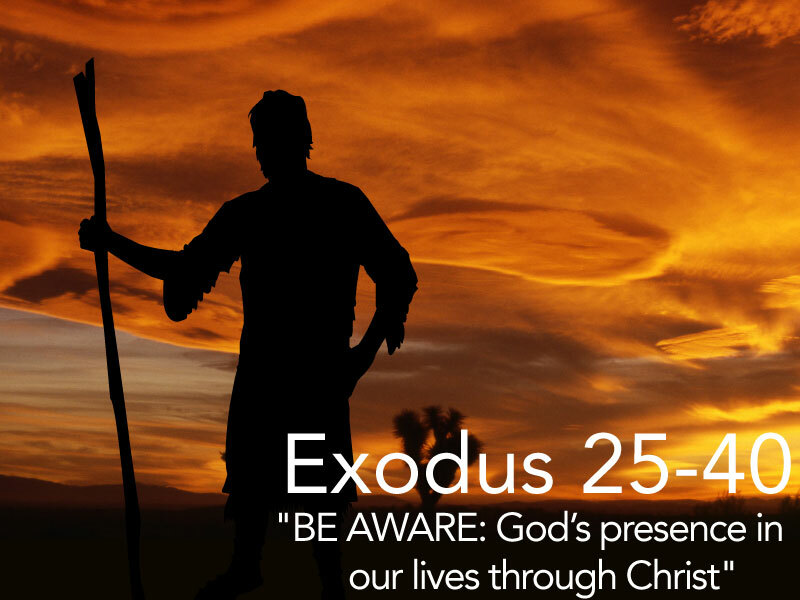 "Camping Out At Fear Mountain: Friendship, Obedience, and Worship"
Storyline #17: Exodus 25-40. "BE AWARE: God’s presence in our lives through Christ"
Just the other night, I woke up to a loud noise which sounded like someone had gotten my front door open and they were trying to rip the chain lock off to get in. As soon as I woke up, the noise stopped. I laid very still in my bed for several minutes listening for footsteps all over my house. I turned sideways, and it looked like someone was standing outside my window looking in to watch my every move. I laid even more still. I finally got up the nerve to go look through my blinds and saw it was the shadows of the trees outside. I then army-crawled on my belly to look under my door to see any feet in my house. I saw nothing. I laid back in bed and fell back asleep after several more minutes. I woke up the next morning and found all my doors locked, nothing missing, and nothing wrong. I guess I totally dreamed-up the noise in my head! When we sense the presence of someone or something greater than us, it changes our every move and consumes our thoughts. Are we fully aware of God’s awesome presence in our lives? God is omnipresent which means He is everywhere at all times, but God is especially present with His people in a very specific way. In Exodus 25 – 40, God commanded Moses to have His people build Him a tabernacle so that He could dwell among them and they would know He is their God (29:46). While God was commanding Moses this very thing, Israel was at the bottom of the mountain making an idol so that their “God” would be present among them. This infuriated God so much so that He told Moses He would not go with them to the Promise Land (33:3). This news devastated Israel. So Moses went outside the camp to the Tent of Meeting. God descended from heaven to the tent in the pillar of cloud, and all the people would watch from their own tents in worship. There Moses begged God to go with them and dwell among them. He didn’t want to go any farther without God’s presence (33:8-16). Do you feel that way about God’s presence in your life? Do you refuse to go anywhere, to not do anything, to not make any decision without being aware of the presence of God Himself? Many Christians today do desire to have contact with God, but they leave the daily experience with God to the professionals. They go to church to hear from a pastor who has a real relationship with God, to pray for them, and to study God’s Word for them. All those are great things, but each Christian should personally be aware of God’s dwelling presence in their life. How is God present in our lives today if there is no Tabernacle or Tent of Meeting? John, one of Jesus’ closest friends and disciples, wrote “And the Word (Jesus) became flesh and dwelt among us, and we have seen His glory, glory as of the only Son from the Father, full of grace and truth.” Wow! John is saying that just as God dwelt among His people in the Old Testament by His glory, Jesus has dwelt among His people in the New Testament. The author of Hebrews says that whenever God’s glory is present, Jesus is present. How is God present in our lives today? He is present through our union with Jesus Christ in salvation. My favorite basketball player of all time is Michael Jordan. I saw him play one time against the Hawks in Atlanta. But there was another time that I got to go to Jordan’s personal restaurant in Chicago. While we were eating, our waitress told us that Jordan was in the building that day doing a press conference. I got more excited than being at the game! He was supposed to be there, but this was being around Jordan in my every day life! When we learn to be aware of God’s presence in our daily lives, we change. Our relationship with Him is deepened because we realize how near He is. Our power over sin is strengthened because we do not want to bring Him shame in His presence. Our courage to witness is heightened because we want those around us to experience His personal presence just like we are. I pray that no one thinks they sense God’s presence, imagine Him watching over us, lay still to listen to Him, and even look around to see Him there…but wake up in eternity to find that it wasn’t God after all. It was our imagination. Is God present in your life by believing in the saving gospel of Jesus Christ?